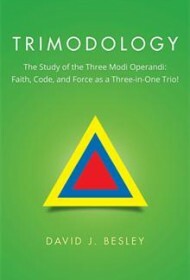 Trimodology: The Study of the Three Modi Operandi: Faith, Code, and Force as a Three-in-One Trio! Australian author David J. Besley certainly has his heart in the right place as he outlines his formula for human harmony in this book. The author envisions the enlightenment of mankind and an end to violence and alienation, through a “Trimodal” synthesis—he calls it an “equilibration”—of warring modes: Faith (encompassing religion and love), Code (law, authority, the criminal courts) and Force (the military and police, associated with war and pain). Unfortunately, language this obscure does little to advance Besley’s case, and it’s a challenge to fully grasp his theories (for instance, he writes that mode “singularsers” can never solve the “trilemma” of Faith, Code and Force the way accomplished “generalisers” do), or to navigate the dense complications he brings to later chapters. His private vocabulary (“stationary quadrupedia,” “tensities,” “genericity”) and bewildering farrago of charts and diagrams might prove intimidating to many. The book glows with such purity of intent, however, that readers seeing the essential goodness in his quest for grace and human understanding may forgive the frequently abstruse prose. Trimodology is repetitious and often baffling, but author Besley ably provokes the curious reader’s mind and spirit for 300 pages. He even offers, in his addenda, a “trimodal” approach to reducing one’s smoking habit—a kind of nicotine gum for deep thinkers. Bravo.